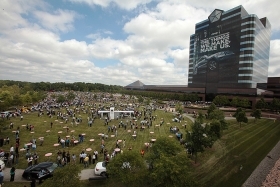 Chrysler LLC owns its suburban Detroit headquarters, but a loan with the building as collateral has changed hands. DETROIT -- A group of national and Metro Detroit investors is expecting to cash in on a loan deal involving the Chrysler LLC headquarters building in Auburn Hills, Mich. Details coming to light about the quietly brokered deal indicate a $225 million loan -- which uses the 4.4 million-square-foot building as collateral -- was purchased for $60 million, according to sources with knowledge of the deal. The loan buy was led by OZ Management LP, a New York-based subsidiary of investment management firm Och-Ziff Capital Management Group, according to local property records. The records indicate the loan amount was $225 million and held by Citigroup Global Markets Realty Corp. until March, when it was transferred to CHQ LLC, an entity incorporated in Delaware. The articles of incorporation for CHQ were signed by Joel Frank, who is also CFO of Och-Ziff. OZ Management and Och-Ziff do not comment on any investments they may or may not be involved with, according to a statement released by its New York-based public relations firm Abernathy MacGregor Group. The deal was structured with 20 percent of the funds coming from local investors, according to sources with knowledge of the deal. The local group was led by David Friedman, CEO of Friedman Real Estate Group. Amy Schiffman, Friedman director of marketing and administration, declined to comment on the deal. The $60 million investment is to be repaid by Chrysler's mortgage payments over two years; the remaining payments are profit. The building continues to be owned by Chrysler. There have been some loan sales in the area recently with more expected in the near future, said Steve Sallen, president of Maddin, Hauser, Wartell, Roth & Heller PC in suburban Detroit. Sallen, who is not familiar with the Chrysler deal, said loan deals are typically structured where the selling lender is willing to offer a discount as a way to speed the process of cutting ties with a company or its real estate. “Lenders have been making the internal decision, for one reason or another, that it is better to speed up the process and sell the note in order to achieve their goals,” Sallen said. The upside to buyers, he said, is that they get a loan at a sometimes deep discount and can either make a profit if the loan is paid off or end up with ownership of the real estate if the loan goes bad. Chrysler originally financed the $1 billion project itself when construction started in 1990, then transferred ownership to a trust, leasing the building from the trust. When Cerberus Capital Management LP took 80 percent ownership of Chrysler in August 2007, the investment firm also bought the building for $325 million, according to past reports in Crain's Detroit Business, an affiliate of Automotive News. That loan was later refinanced with Citigroup, which held it until the recent sale.